Horse racing is an equestrian sport that involves two or more horses ridden by jockeys racing on a course in a bid to finish first. It is one of the world’s most ancient sports and was practiced in Ancient Egypt, Ancient Greece, Syria, and Babylon and by most civilisations and cultures in some form or another since. Thoroughbred racing, which is what we generally have today, was made popular in Britain amongst the aristocracy and is why horse racing is known around the world as the ‘Sport of Kings’. Popular across the world, it is particularly popular in the UK with races, such as the Grand National, as well as in the USA with the Kentucky Derby, and the Middle East, where many of the top horses are owned and bred. Flat Racing: This is where horses race around a straight or oval horse racing track unhindered by hurdles or fences. Jump Racing:This is where horses compete around a track but have to jump over hurdles or obstacles (known as National Hunt in the UK) to win the race. The object of horse racing is to win the race and this involves a great deal of skill and insight from the jockey, as well as huge physical effort from the horse. Whereas a short sprint race may be reasonably straightforward, longer races such as the Grand National, which are run over several miles require the jockey to race tactically, riding to their horse’s strengths and plotting the right time to strike for home. Perhaps the most important piece of ‘equipment’ in horse racing is the horse. Those suitable for horse racing include Thoroughbreds, Arabian horses, and Quarter horses. Differing national organisations may have their own rules as to what horses can compete. All riders wear a helmet and all carry a whip too. This can be a controversial piece of equipment as it is used to whip the horse to spur it on to go faster. On some countries, jockeys are allowed to use the whip whenever and as much as they like, although some countries like the UK limit the number of times it can be used to prevent any distress to the horse. There is no scoring in horse racing with it being an out-and-out race in which there can only be one winner. However, at some horse racing meetings, there may be other things to win too as a bit of an aside, such as an award for the ‘best dressed horse’, which recognises the physical condition and presentation of the horses. 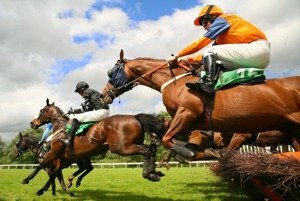 To win a horse race, a jockey must navigate the course with his/her horse, jumping any required hurdles or fences and then arriving over the finishing line before any of the other participating horses and riders. In the event of two or more horses crossing the line together making it impossible for the naked eye to judge who won, then a photo finish is declared. This is where a photograph of the finish is studied by the stewards to see who crossed the line first. Once the stewards have made their decision, they declare this horse as the winner. If a winner cannot be decided, the race will be settled according to dead heat rules. Differing national horse racing organisations may have differing rules concerning how horse races should be run. However, by and large, the vast majority of rulebooks are very similar with many being based on the British Horseracing Authority's original rulebook . All flat races must be started from starting stalls or a starting gate. All steeple chases, hurdle races, and jump races must be started with a starting gate or a flag (requires special permission). In extraordinary or emergency circumstances, any horse race, regardless of type, may be started with a flag as long as the starter decides this or the stewards permission has been sought. A false start will be declared if the starter considers that a horse has broken away before the race has started. Riders must then attempt to ride their horses to the best of their ability in an attempt to win the race. Disqualifications and further sanctions may occur if, in the stewards opinion, the rider has not done this. Riders must ride in a safe manner and follow the prescribed course, jumping every hurdle (if present). To complete the race, a rider must cross the finish line on his horse. Depending upon the particular race, there will usually be an amount of prize money to be split amongst the first, second and third finishers.